1 Sit on the chair and ensure the seat pan is smaller than your thighs (There should be 3-4 fingers clearance between the front of the seat pan and the back of your knees. 2 Raise the chair height until your elbows are just above the height of the desk and the forearms are perpendicular with the floor (Elbows forming a 90 degree angle). 3 Ensure your feet are adequately supported by the floor or a footrest – this reduces pressure on the back of the thighs and encourages spinal contact with the backrest. 4 Adjust the backrest height so the ‘small’ of the back is supported by the most prominent part of the backrest and recline the backrest slightly to ensure the weight of your torso is distributed through it (Recline of 10-20 degrees off the vertical is researched to be optimal). 5 Adjust the screen distance so that it is approximately arms length away from you (500-750mm). 6 The screen height should be altered so that the TOP of the screen is level with your horizontal sight line. 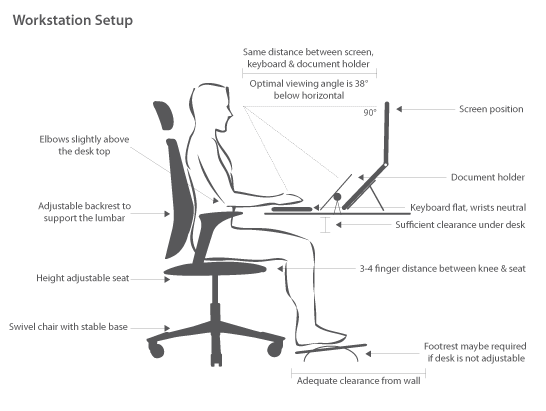 7 Ensure that the keyboard and mouse are positioned to allow a small amount of support from the desk but not too far to encourage overreaching or forward leaning. 8 Place documents and reference material close to the screen to minimise head movements. This can be either side or between the screen and the keyboard. Use document holders if available. 9 Minimise eye strain by adjusting the screen brightness and contrast to your own personal comfort and regularly take visual breaks (20/20/20 rule – after every 20 minutes of screen use, look away to a distance of 20 metres for at least 20 seconds). 10 Take regular ‘micro pauses’ away from the workstation. Most injuries in office environments are associated with the prolonged static postures that are maintained throughout the day. Task rotation to increase postural variety is helpful and taking the opportunity to refill your glass of water will keep you on the move! Prepared By Matt Baker BSc (HONS) MCSP PG Dip Erg. A university qualified physiotherapist with over 15 years experience. Matt studied ergonomics at the Robens Institute of Health Ergonomics at the University of Surrey and has undertaken workstation assessments, risk assessments and training in both Sydney and London.